The RaceGrade High Output Ignition Coil is an inductive ‘smart coil’ capable of producing extremely high spark energy (103mJ +) making it ideal for many high horsepower applications. The coil-near-plug form factor allows it to be remotely mounted away from the cylinder head to promote lower operating temperatures of the coil, improving longevity and performance. The RaceGrade High Output Ignition Coil is ideally suited for a wide variety of applications, ranging from moderate powered endurance applications through 3000+ horsepower blown alcohol motors. It is the ideal combination of high spark energy and long spark duration. Field proven for exceptional reliability and performance, the RaceGrade High Output Ignition Coil's built-in igniter allows for a simplified installation and is ideal for use with all MoTeC ECU’s (and most other brands). No external igniter or CDI is required for these coil to function. 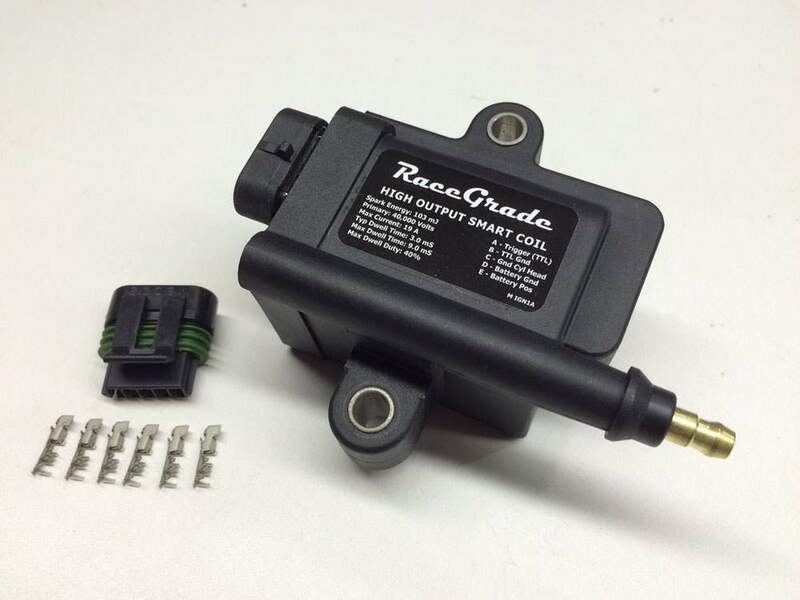 When installing the RaceGrade High Output Ignition Coil, special attention must be paid to the quality of the connections due to the immense energy of this coil. The center pin (Terminal C) MUST be grounded to the cylinder head. The coil will not supply full power if it is not grounded to the cylinder head. Please refer to the Characteristic Dwell Time chart listed below. The coil will overheat if operated at excessive duty cycles for prolonged periods. Do not operate this coil at a duty cycle greater than 40%. Note: The connector is a ‘pull to seat’ connector. The wires must be fed through the connector before termination.